An independent global citizenship without a local component and in the absence of the much-feared global government creates two concerns. One, an individual may imperil the rights of others, without a structure that can impose sanctions for the heinous conduct. Two, an individual's rights may be imperiled, and there may be no entity to provide protection. This essay proposes a model of a formal global citizenship that will alleviate these concerns and prove both practically and theoretically feasible. The model flows from the concept of dual or multiple nationality and offers global citizenship only as an elective nationality. 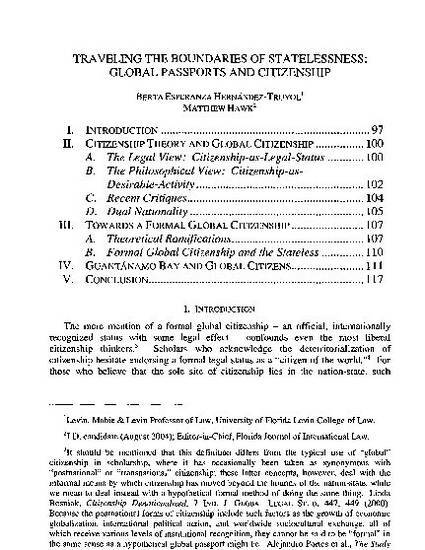 Such citizenship would co-exist with the nationality acquired by birth or naturalization, thereby guaranteeing that at least one nation-state always has the ultimate responsibility for the individual. At the same time, by providing for careful considerations on who may acquire global citizenship, the value and meaning inherent in citizenship can be preserved and enhanced. Indeed, the idea of a global citizenship that is a formalized development emerging from the human rights tradition can be a foundation for the attainment of full personhood by those marginalized or disempowered within their own or foreign national borders -- the poor, racial and ethnic minorities, indigenous populations, and women who at present lack equal status in any local or global community.